27 JAN 2019: FamilySearch is BLOCKING the GetLinks program so you cannot perform bulk downloads from their site. GetLinks still works on the no-restrictions Antenati website. 4 SEP 2018: New images and tips about GetLinks. 10 JULY 2018: New link to the software. 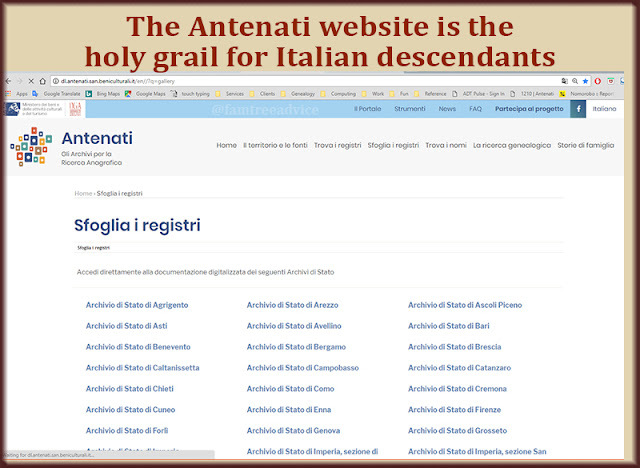 Italy has a genealogy website Italian descendants love. With some luck, it may contain your ancestor's birth, marriage and death records. For me, it's the ultimate at-home research tool. I spent about five years visiting Family History Centers to view microfilmed vital records from my maternal grandfather's hometown in Italy. I documented everything, piecing together 15,000 relatives. But my current job doesn't allow me the time to continue in this way. One caveat: You must know the hometown of your ancestor. See "6 Places to Discover Your Ancestor's Town of Birth". Here's how to use this Italian genealogy site without understanding Italian. At the end of this explanation, I'll tell you how to download entire collections of images automatically. PROVINCE. Click your ancestor's province. If you know their town, you can Google it to find out its province. A province is roughly the equivalent of a county in the U.S.
Stato civile napoleonico—The Napoleonic Era in Italy lasted from 1805 through 1814. These documents may cover a portion of those year and run through 1815. Stato civile della restaurazione—This Restoration Period (1816–1860) spans the time between the end of the Napoleonic Wars and the unification of Italy. 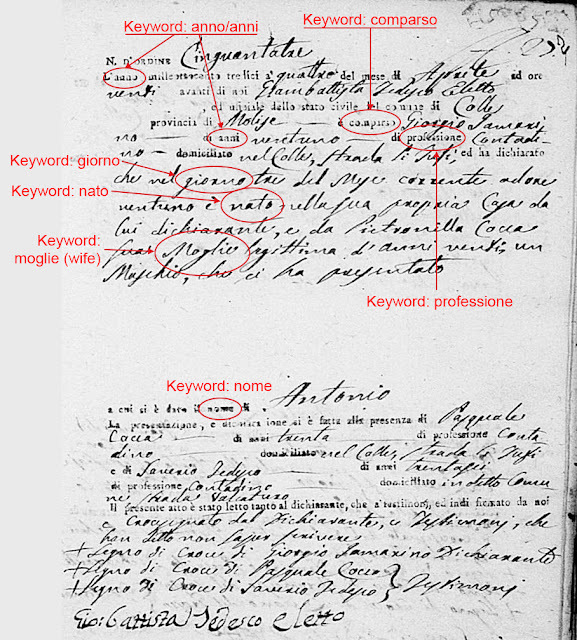 Stato civile italiano—These are civil records beginning in 1861. …the exact years available depend on the town. TOWN. Click your ancestor's hometown. Diversi—Various documents not included in other sets may be birth records for illegitimate babies, death records for stillborn babies, or marriage records. Matrimoni—Marriage licenses may include the date of the wedding and the name of the church. Matrimoni, pubblicazioni—Couples who wanted to marry had to publicly post their intentions twice before getting permission to marry. 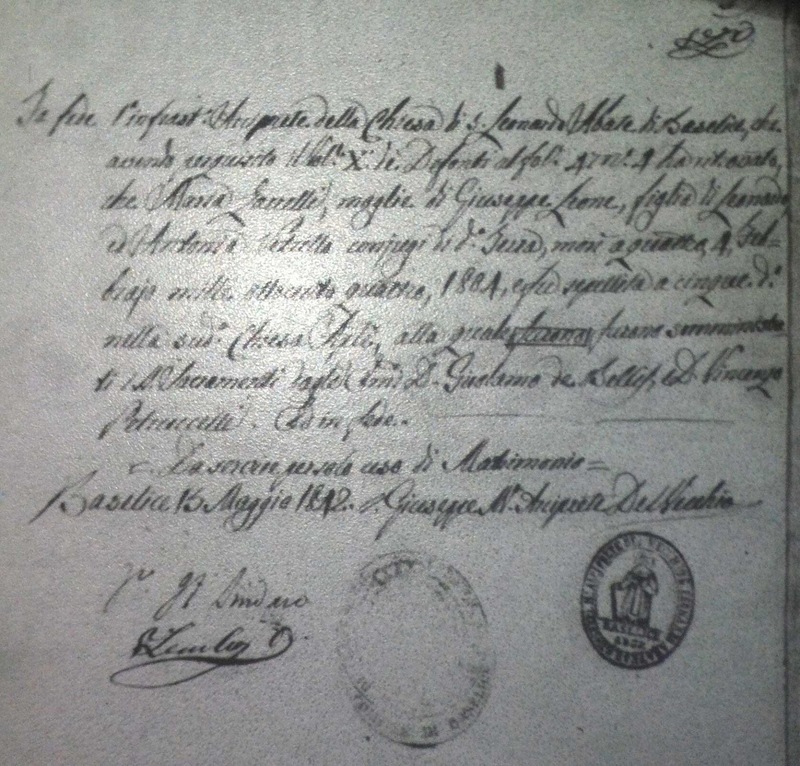 Matrimoni, processetti—Each marriage generated several documents including (a) the birth certificates of bride and groom, (b) the death records for their deceased parents, and if the bride or groom's father was dead, you might also see their grandfather's death record, (c) their permission to marry, and (d) the date of their wedding in the church. Allegati—These are additional records for any of the above categories. YEAR. One by one, click a year, then click the archive number (it's the only thing on the page) to see the list of images (immagine), 45 per page. ENLARGE. When you select an image, click the image itself to enlarge it. SAVE. You can right-click the enlarged image and choose Save Image As, or save time by right-clicking the unenlarged image and choosing Save Link As. I spent weeks downloading the records from my paternal grandfather's town one at a time. Then I learned about a software app called GetLinks that sped up the process so much, I went on to download my great grandmother's entire town in two sittings! Download the file and double-click to expand it. Then double-click to run the program is called ArchiveDownload.exe. At the top, click Opções (Options), then click Opções again. I find that 3 simultaneous downloads works efficiently. If you will be accessing Familysearch.org, enter your login info on this screen. Click OK. NOTE: If you do not see the Cancelar and OK buttons at the bottom of this window, simply drag down the bottom of the window until you do. If you don't click OK, your folder choice is not saved. Make sure you're seeing the OK button. Click the Go! button. If things don't start happening within 2 seconds, look at the Download button on the right. If it is red and says “Download: Off”, click it so it's green and says “Download: On”. Doing this, I downloaded every record from 5 or 6 towns. Bottom line: If your town is included, your life is about to change for the better. What Can You Do With These Records? 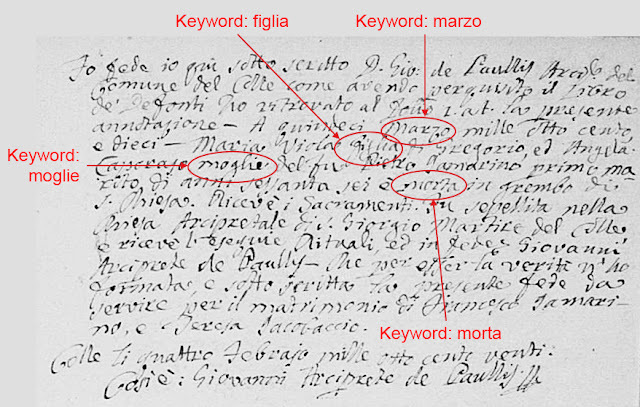 I've spent countless hours harvesting information from old Italian vital records. It was a little intimidating at first, but once I became comfortable with the most important genealogical words—and completely memorized my numbers—I stopped seeing these documents as being written in a foreign language. To me they are fairly straightforward documents filled with highly valuable data. 1804 Italian death record. No big thang. You can achieve this familiarity with foreign languages, too. You can learn the key words you need to identify in a foreign document. And once you look at enough documents to get comfortable with the strange, archaic handwriting, you will be fine. There is much more country-specific information available in the wiki, so if you don't see the language you want here, or if you need to understand how vital records work in another part of the world, start at the world map. My list above is very European focused because I did not find language help for African, Middle Eastern or East Asian countries. But there is plenty of critical information available about how records are kept, marriage practices, and more. Take advantage of it!